Mitsui O.S.K. Lines, Ltd. (MOL)’s LNG-fueled tugboat Ishin bunkered LNG fuel in Sakai Senboku Port for the first time on January 31, in preparation for test operation. MOL ordered the vessel from Kanagawa Dockyard Co., Ltd. This is the first bunkering of LNG as a vessel fuel at any port in the Kansai region. 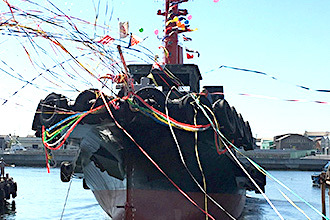 The Ishin’s excellent environmental performance – including an estimated 25% reduction of CO2 emissions in comparison to tugs that run on A fuel oil – earned the top rating of four stars from the Ministry of Land, Infrastructure, Transport and Tourism’s energy-saving rating scheme for Japan’s costal ships.